At 28 megawatts and nearly 82,000 panels, the Adams County solar farm is the largest to date in Washington. However, an even larger solar farm has been proposed on 300 acres nearby. 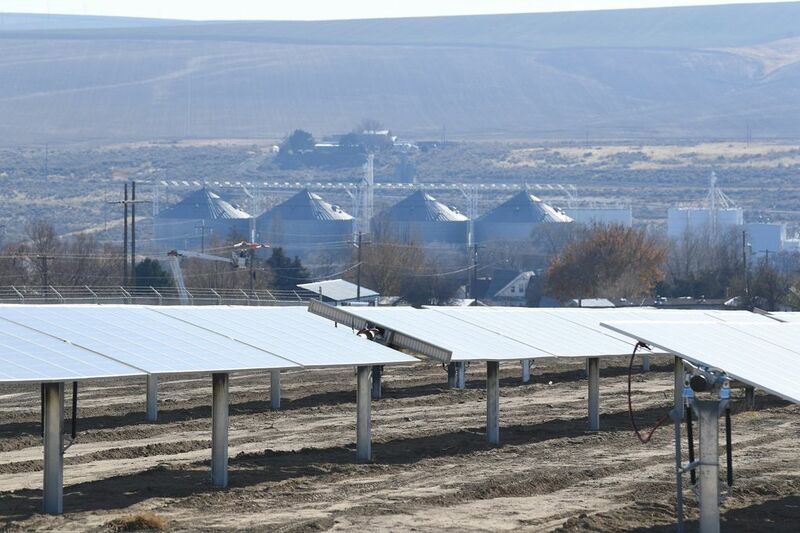 LIND, Adams County — Washington’s largest solar farm will begin commercial production next month in this Columbia Basin town better known for its annual Combine Demolition Derby. Nearly 82,000 solar panels have been installed near Lind’s pioneer-era cemetery, resembling a mirage on the dusty landscape. Sensors adjust the angle of the flat, blue panels throughout the day, allowing them to maximize the capture of solar rays. “In a really creative way, it’s an expansion of our agricultural industry because it’s harvesting the sun,” said Stephen McFadden, the economic-development director for Adams County. The solar farm’s output will help a Spokane Valley manufacturer 85 miles to the east move to all renewable energy. Hotstart signed an eight-year contract to purchase solar power from Avista Corp. The Spokane-based utility is buying the electricity from the facility’s owner — Strata Solar of North Carolina — and reselling it to 60 large commercial and industrial customers. Hotstart will buy 6 percent of the solar farm’s output, about 1.2 megawatt hours of electricity per year. That’s the maximum allowed under Avista’s program, and it just happens to mirror Hotstart’s annual electric load. Hotstart makes preheating systems to keep large engines — which don’t start easily in the cold — above 100 degrees. The company’s products are sold in 180 countries. That’s a selling point for some Hotstart customers, who prefer products manufactured with all renewable energy, Judge said. STCU (Spokane Teachers Credit Union) also signed an eight-year contract to buy solar electricity from the Lind facility. The credit union is buying about enough solar power to offset electric use for a building at STCU’s Liberty Lake headquarters. Data servers running the electronic financial system are housed there, so the building is a larger power user, said Richard Breitenberg, STCU’s director of facilities and support services. With the help of a Washington state incentive, Avista is selling the electricity at the same price as other rates for large commercial users. The incentive is valued at about $9 million over the eight-year contract. At 28 megawatts, the Lind solar farm is the largest to date in Washington. However, an even larger solar farm has been proposed for Adams County. 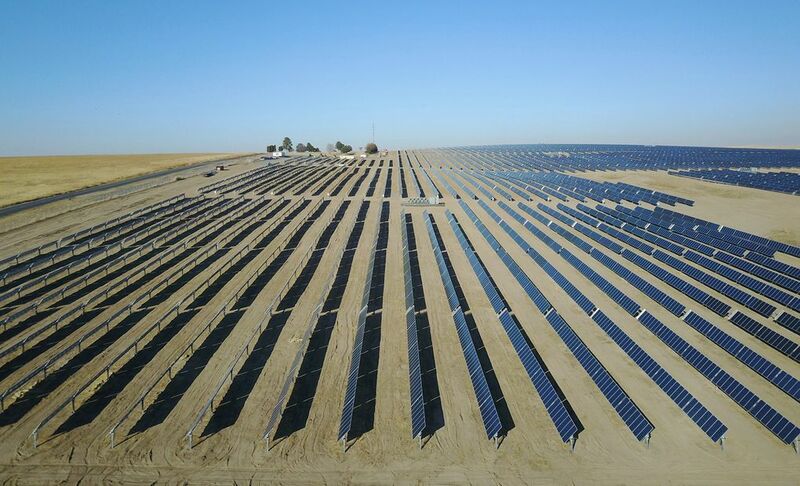 Innovative Solar Systems LLC of Ashville, North Carolina, has proposed a 40-megawatt solar farm about 10 miles northeast of Ritzville. In September, Innovative Solar received a conditional-use permit to build a solar farm on 300 acres. The company is working to secure a power purchase contract with a utility, said Mike Hill, land-development associate. “We love the idea there are other solar companies looking at Adams County,” said McFadden, the economic development director. Parts of Washington’s central Columbia Basin have high potential for solar development, according to the National Renewable Energy Lab in Golden, Colorado, which evaluates areas based on weather, atmospheric conditions and hours of daylight. In Central Washington’s Kittitas County, the recent approval of a 25-megawatt solar project on irrigated agricultural lands sparked controversy. McFadden, however, said he’s heard “zero opposition” to the two solar projects in Adams County, neither of which is on ground that was actively farmed. The Lind solar farm will generate about $200,000 annually for local taxing districts, McFadden said. Construction of the facility employed 150 workers through the summer and early fall, providing a short-term economic boost to the area, he said. About 25 percent of the workers were hired locally. Marshall Micheli walked through the Lind solar farm on Thursday, explaining how the electricity produced by the panels is converted from direct current to alternating current, then sent to a transformer and eventually to the power grid. He’s an assistant superintendent for Swinerton Renewable Energy of San Diego, which built the facility for Solar Select. The solar farm is producing about 15 megawatts of electricity during a test phase, and it will ramp up to full production by early December, he said. Although the project is large by Washington standards, it’s the smallest solar farm Micheli has worked on. 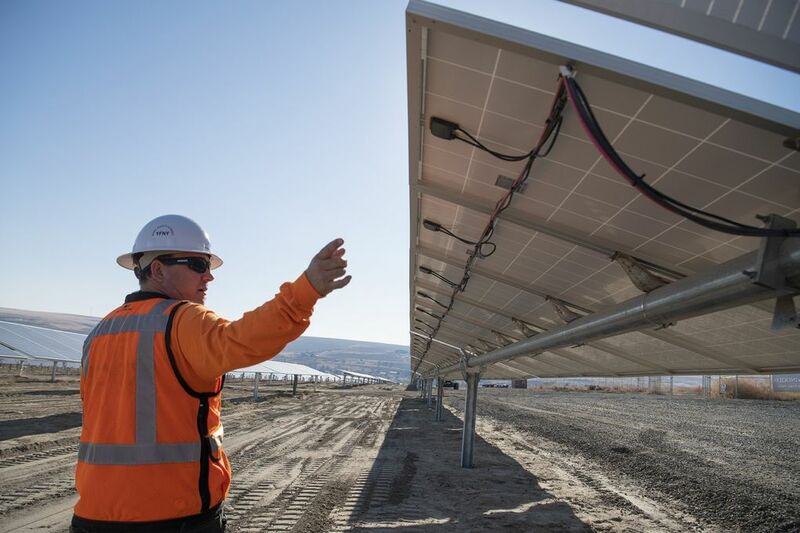 California and the Southwest have larger solar projects. Hydropower has been the backbone of renewable energy in the Northwest, and solar has been slower to develop, McFadden said. Now, “we’re welcoming solar as another element of renewable energy to Adams County,” he said.